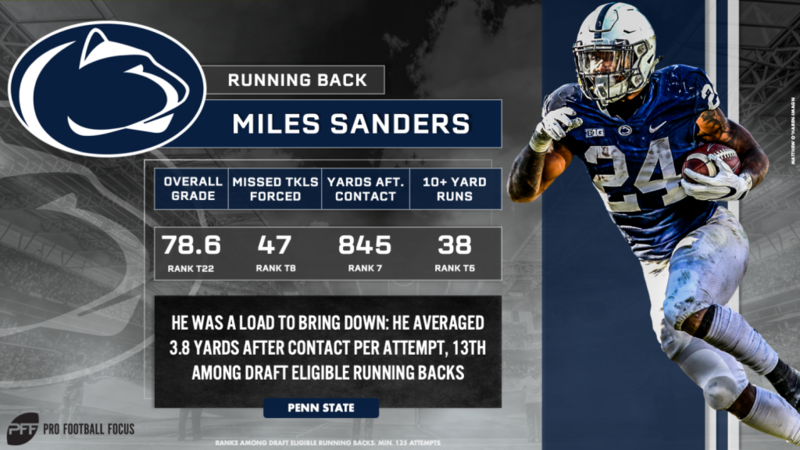 Despite ranking inside the top 10 in forced missed tackles (47), yards after contact (845) and runs resulting in a first down or touchdown (38) in 2018, Penn State’s Miles Sanders is on the outside looking in at the conversation of best backs in the 2019 draft class. But he knows that shouldn’t be the case. Aiding Sanders’ ability to win in all areas of the game is his ability to survive first contact and make people miss. Among the 55 FBS backs with 200 or more touches (rushes + receptions) this past season, he ranked eighth in yards after contact per touch (3.68) and 20th in forced missed tackles per touch (0.202). When contacted at or behind the line of scrimmage on rushes, Sanders totaled 322 yards after said contact across 81 carries in 2018, ranking seventh among the 96 FBS backs with 60 or more such carries. Weighing in at 5-foot-11, 211 pounds, Sanders is masterful with his sudden jump cuts and spin moves, but he’ll also surprise defenders with his ability to remain effective with his stiff arm and lowered shoulder. He always wants to keep defenders guessing and takes pride in always making the first man miss. Pegged as a five-star athlete coming out of high school and a gym rat by all definitions, Sanders attributes a lot of his success in the open field to his natural athletic ability and commitment to the weight room. But he also holds film study in high regard and spoke to its positive effect on his elusiveness. Sanders is also watching film of himself to improve in areas NFL teams called out as areas he still has room to develop, including pass protection and ball security. In 2018, Sanders allowed seven total pressures across his 90 snaps in pass protection, ranking tied for 77th in pass-blocking efficiency (96.1) and tied for 91st in pressure percentage allowed (7.8%). He also fumbled the ball five times across his 220 carries, earning the fifth-highest fumble percentage (2.3%) among FBS backs with 150 or more carries. Sanders has made it his priority to improve in both areas of the game through film study and on-field drills, knowing such improvement is necessary at the next level. His commitment to improving comes from his experience competing with and learning from another great Penn State running back. Sanders will join Barkley at the NFL level soon enough, and his play should follow suit with his former teammate when given the opportunity.